This week’s Other Voice is one I first heard a little more than 2 years ago. It still remains my favorite new book since that time, and maybe my favorite book ever in terms of making an actual connection between spiritual formation and social justice. Christopher Heuertz. Simple Spirituality. Intro by Shane Claiborne. Softcover, 160p., $15.00. IVP. Forgive the ho-hum-how-many-more-books-can-we-TITLE-like-this-anyway-FCOL? title. And because of that, this book didn’t look all that appealing to me either when I picked it up at National Pastors Conference in early 2009. Nonetheless, my wife Marion insisted we buy it for our daughter Amy because it had an intro from her homeboy Shane Claiborne (another better-known voice you should check out if you haven’t already — run, don’t walk, to The Irresistible Revolution). Amy still hasn’t read this book, but I have. And suffice to say, while the common adage around our house is “Amy is her father’s daughter,” it’s probably worth remembering that the reverse is true, too, i.e., I’m my daughter’s father. In short, in God’s twisted sense of humor, I have no doubt that we did really buy this one for me. Make no mistake: Christopher Heuertz, executive director of Word Made Flesh, is throwing down the gauntlet to the church. (See also his blog If I Blogged…. to the lower right.) But as opposed to the many books today that are long on well-placed criticisms and short on solutions (cough, cough, emergent, cough), Chris puts his money where his mouth is, working with the poorest of the poor and challenging us to get involved wherever we’re at. So in Simple Spirituality, we get many stories of the author’s visits to the “Majority World” countries (nice turning of the term “Third World” on its ear, BTW), and his extensive work with Word Made Flesh. As Chris Heuertz tells his stories, there’s very little altruistic or noble in the accounts. Over and over, you see someone who’s broken by what he sees — and who never gets used to the suffering he encounters — and yet presses on, finding his own sanctification in it. As Chris quotes Mother Teresa (whom both him & Shane had the opportunity to work side-by-side with at Nirmal Hriday), “The poor give us much more than we give them. They’re such strong people, living day to day with no food. and they never curse, never complain. We don’t have to give them pity or sympathy. We have so much to learn from them.” This book brings that message home over and over. Another quote of Mother Teresa’s (in Shane’s intro) sets the tone early on, “It is very fashionable to talk about the poor. Unfortunately it is not as fashionable to talk to the poor.” This book is filled with that “talking to.” In fact, despite the considerable work being done, more times than not we see more examples of the poor sharing their meals (if not giving them away) to Chris than the reverse. And it never fails to devastate him or me each time I read it. And while the mission is toward the poor, it starts with the self. And that brings us to the spiritual-formation part. The overall structure of the book in fact revolves around five “simple” disciplines: Humility, Community, Simplicity, Submission, and Brokenness. And if you’ve already surmised that simple isn’t easy, you’re on the right track. This book reduced me to human rubble on a number of occasions. And hopefully that rubble can be used to build something better. For me, being vulnerable is much more difficult than being transparent. I have a hard time exposing the parts of me that can be wounded. Sure, I can share my feelings with someone, but it’s tough for me to trust people with my feelings. It’s not easy for me to put my needs out there and give someone a chance to reject them. And so what I usually do is work toward transparency as a distraction from my lack of vulnerability. It can be easy to read all this and walk away. I didn’t want to do that. After being crushed by this book, I wrestled with a way to get involved, somehow. Fact is, I can directly trace my reading of this book to my involvement with our local Center for Adult Learning, helping people 90% of whom are below the poverty line to get their GEDs — and truth is, I get more reward out of it than they do. It’s a long way from what Chris does, but it’s nonetheless what God’s shown me I can do. And that in itself is far more value than the cost of a book. So now it’s your turn, before Chris’ next book comes out (he just signed a deal with Howard Books). 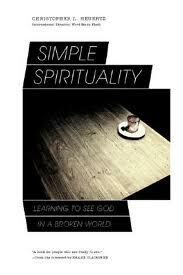 Read Simple Spirituality. Be vulnerable. Be broken. Be transformed. And be ready for what God wants to do with that. This entry was posted in Uncategorized and tagged book review, christopher heuertz, community, humility, simplicity, social justice, spiritual disciplines, spiritual formation, submission, word made flesh. Bookmark the permalink. This was convicting. I have read Friendship at the Margins by Chris Heuertz, I definitely want to pick up this one.